You might think that since Miniature Schnauzers are hypoallergenic dogs who shed very little, it means they don’t require a lot of grooming or frequent haircuts, but this is untrue. In fact, their limited shedding actually has the opposite effect, and you’ll need to take care of your Schnauzer’s coat regularly to keep your pup’s coat healthy. Of course, their grooming needs will depend on your preference as the owner–if you are entering your dog into shows and competitions, you will care more about constant grooming, but if they are just your family pet, you probably won’t tend to their coats as much. Either way, it’s important to know what is required to help maintain your Schnauzer’s short, soft, healthy coat. 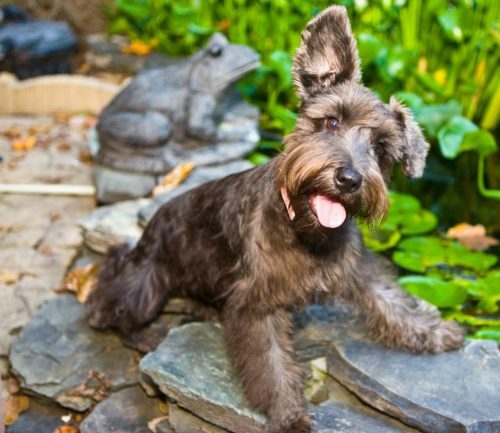 Miniature Schnauzers are rather square, sturdy little dogs that typically stand from 12 to 14 inches tall and weigh between 11 and 20 pounds. Their distinctive feature is their beards (Schnauzer actually translates from German to “small beard”) and a wiry coat of fur that typically comes in black, black and silver, salt and pepper, or in some rare cases, even white. They have bushy eyebrows and deep-set eyes, which gives them the look of a grouchy dog at times, though they are generally quite friendly and loving. Their ears are set high on their skull and can be cropped or uncropped. Their tails are high on their back end and are typically docked and erect. Miniature Schnauzers come with a double coat that consists of a soft, thick undercoat and a wiry topcoat. Their dog grooming needs actually stem from the fact that they don’t shed their coat very well. While most dogs will shed fur off of their bodies rather easily, Schnauzer’s loose and dead hair can get trapped in their double coats. This means you will have to get that hair out yourself or routinely take your pup to the groomer. Because of their double coats and inability to shed properly, Miniature Schnauzers require fairly constant grooming. They need their coats clipped or hand stripped, the latter of which can be a very time-consuming process that is usually reserved for show dogs. Hand stripping their coat requires quite literally plucking the fur out by hand while using an electric clipper to shave your dog’s coat is much quicker and easier. 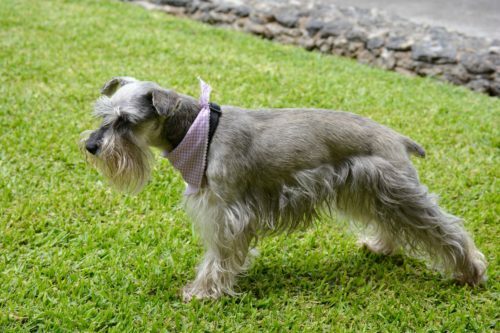 Some Miniature Schnauzer purists would say that their coats should never be clipped because it will make your dog’s coat softer and more prone to matting, while others would argue that hand stripping is uncomfortable for the dog and too time-consuming. Some breeders simply won’t even do it anymore. However, you can still perform both grooming processes at home if you want to spend the time and save money on your pet’s grooming. If you do go with the hand stripping technique, you can do it a section at a time throughout the year, you just have to remember where you’ve left off so you aren’t doing a good job of taking care of one area while neglecting the rest of their coat. A typical Miniature Schnauzer cut includes keeping a tight coat on their bodies and a trimming of their trademark beards. To best maintain a healthy coat and keep your Miniature Schnauzer looking handsome, you should give him a haircut or take him to the groomer every five to eight weeks. It is also important to regularly brush your Schnauzer–two to three times per week will help prevent his fur from matting. Brushing your pup’s coat helps to remove the shedded hair of his undercoat that gets caught in the topcoat. A Miniature Schnauzer’s grooming needs extend beyond just getting the occasional haircut. Most Schnauzers will enjoy the occasional bath to keep their coat healthy and clean and reducing their tendency to develop itchy skin underneath. Bathing and grooming can also be a good bonding experience for you and your dog, but if it is a process they do not enjoy, you may prefer to have this handled by a groomer. Their adorable, trademark beards also tend to be a collection area for food and drink or anything else they get into. They may require additional washing to remove crumbs and keep them smelling fresh. Miniature Schnauzers also tend to have bad breath, so it’s recommended you brush their teeth weekly with vet-approved toothpaste to prevent tartar buildup and promote healthy gums. You should also make sure to check your Miniature Schnauzer’s ears regularly for any signs of wax buildup or irritation which can lead to infection. You can clean your pups ears at home with a cotton ball and a vet-approved cleanser, but never with a cotton swab in his ear canal as you could risk causing further harm. Miniature Schnauzers also have fast-growing nails that should be regularly trimmed with a clipper if they don’t wear them down naturally outdoors. This helps prevent them from overgrowing, splitting, and cracking, which can be very uncomfortable for your dog.